Figure 1. A comparison of dormant and non-dormant seeds. 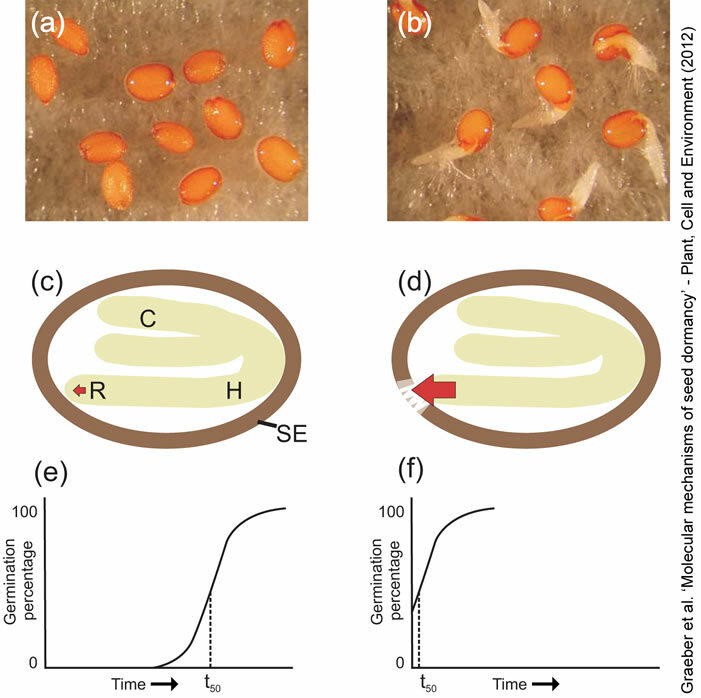 (a,b) Freshly harvested seeds of the Arabidopsis accession Cape Verde Islands are dormant and do not germinate after 3 days imbibition in the light (a), whereas after-ripened seeds have lost dormancy and germinate under the same conditions (b). (c,d) The growth force of the radicle (indicated by the red arrow) does not overcome the strength of the surrounding tissues in dormant seeds (c), but weakening of the surrounding tissues (seed envelopes) and an increased growth force of the radicle enables germination (d). The embryo is shown in green and the seed envelopes in brown. C, cotyledons; H, hypocotyl; R, radicle; SE, seed envelopes (testa and endosperm). (e,f) Germination over-time diagrams of a dormant seed batch with a high t50 value (e) and a non-dormant seed batch with a low t50 value (f).